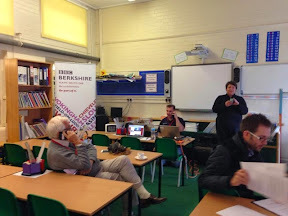 This morning I drove to Caversham Primary School - not to learn anything, but to be part of a live 3 hour BBC Berkshire broadcast about primary schools in Berkshire. Anne Diamond was interviewing a number of us who attended primary schools in the county. I was one of three who went to the school itself where the BBC had set up an outside broadcast. Others phoned in. All in all she managed to talk to at least one person from each era. 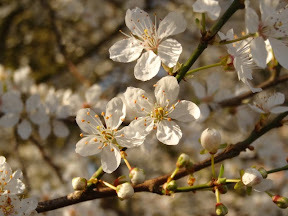 (I related schoolboy stories from the forties when I was at Wescott Road School in Wokingham.) Others talked about their experiences leading right up to the seventies. During the broadcast we all sat in tiny little chairs in the maths classroom. 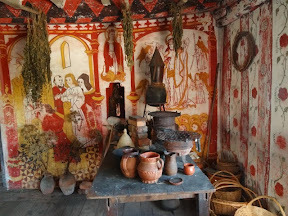 The whole set up was completely different to the classrooms I sat in during my time. 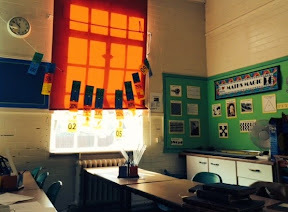 This is a corner of the classroom at Caversham. So what else has been going on since I last wrote a blog. At least the rain has stopped and the river has gone down a lot. My young friend and I spent nearly an hour today scrubbing layers of thick mud off the landing stage. We could the see the damage the floods had done to the boat. It still has water in it - about an inch in the carpeted cabin and about six inches in the engine and central compartments. We'll spend time on Saturday bailing and sponging it out. If the sun comes out we might be able to start the drying out process. I played 'Colours' - a fun game with snooker balls - at Phyllis Court on Tuesday. Surprisingly I played well and even made a few tricky shots and won my first game - but not enough to win the trophy. One day I'll make it. But then pigs might fly! I'm working on three assignments at the same time at the moment - a large watercolour portrait for my cousin Paul which has a background of a fantastic cascade of lilac wisterias, two pencil drawings of children, and a large oil portrait of the headmaster. Being oil, I have to put the headmaster aside from time to time to allow it to dry, hence I'm able to alternate paintings. 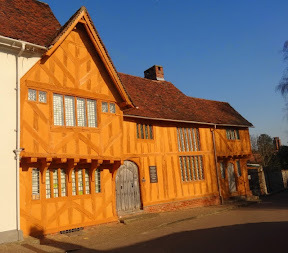 Last weekend my young friend and I went to Suffolk to spend a couple of days with her parents. 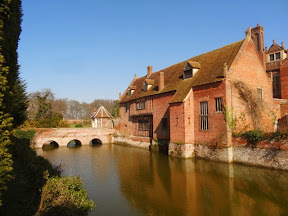 The weather was absolutely perfect - especially on Sunday when we basked in warm sunshine, so together with her mother we visited Kentwell Hall in Long Meltford. 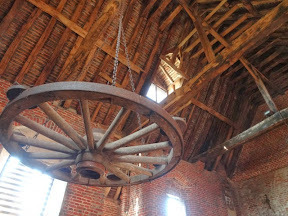 Lucy Norton, the author, described Kentwell Hall as "A little great house of great beauty - paradise on earth" And so it was. A beautiful moated Tudor home set in really lovely gardens and parkland. 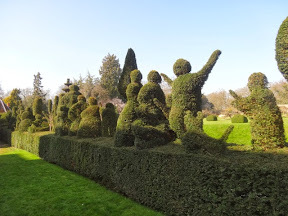 Here's a row of fascinating examples of topiary. And nearby someone has spent a lot of time making a work of art by carving into this tree. 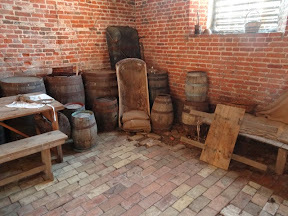 As the house itself was not open on the day we visited, we could only spend time in the gardens and the outhouses. But what a surprise these turned out to be. 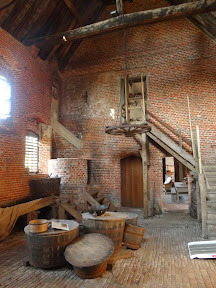 Here are a few views from inside the moat house. We found a sunny courtyard where we had scones, cream and cake. 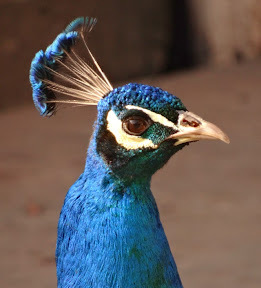 Helped by this very tame peacock who devoured the crumbs we dropped. 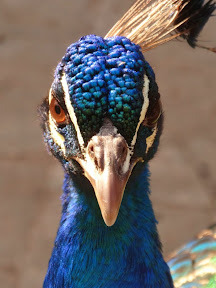 He gave me a bit of a stare when I finished my cake and had no more crumbs to give him. 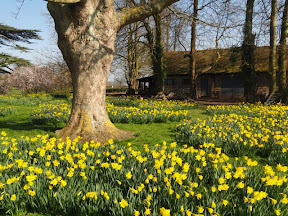 Spring really seems to have suddenly burst upon us and as we left Kentwell Hall daffodils and blossom trees were everywhere. 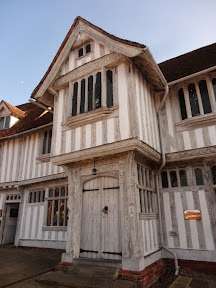 Before leaving Suffolk we visited one of my favourite villages - Lavenham. 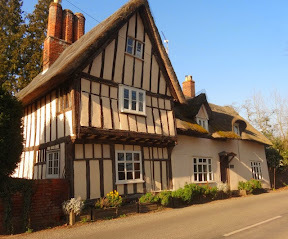 It's described as England's finest medieval village. 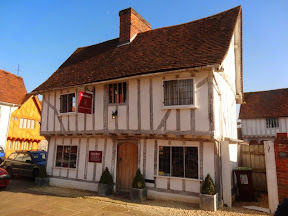 I just adore half-timbering. 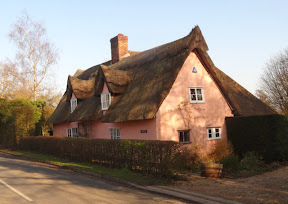 And on the way back home we passed by a number of typical Suffolk houses - some painted in typical pink.